In 1998, I started writing a novel entitled, The Empty Space. After a lush few pages, the project went by the wayside until late in 2002 when I re-approached the story. I did a lot of research and began writing in earnest on March 31, 2003, writing my story as the main character reflecting on the events of her day -- in real time -- starting on Easter, March 31, 3050. By the time I finished the story in March of the following year, it was over 276,000 words -- about 900 pages. 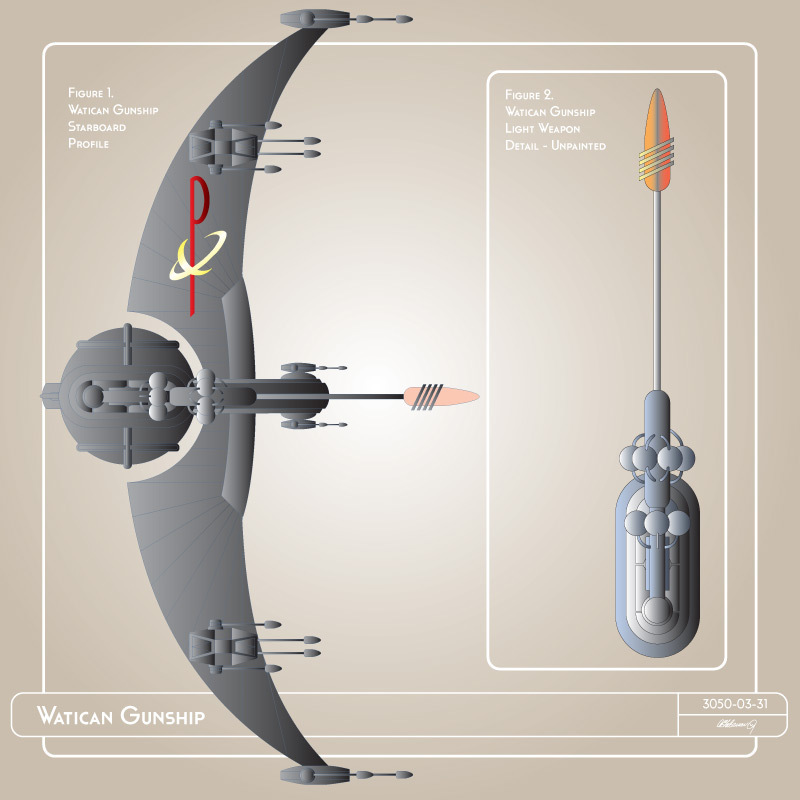 I also made a ton of notes and sketches to help me visualize the universe that I had created, not the least of which was the Watican gunship, the most technical-appearing drawing I have ever done. I made no alterations to the gunship or light weapon illustrations, but I added background, borders and notes for this presentation. Probably not the way you intended it to move, but when I look at this I can see the wings spinning around the center bar, moving the ship forward with spiraling exhaust/light from the tips while that round bit at the front is actually a globe, nestled in that motion.